Everyone say hello to Wamama, the newest Pan-Asian restaurant on the block that’s already scored points for its fun and quirky setting. 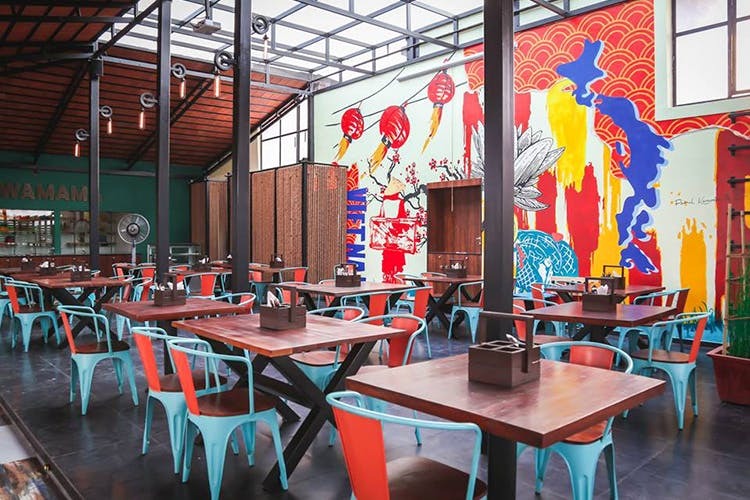 With splashes of colour everywhere, from graffiti on walls to turquoise blue chairs, there isn’t a dull corner at this restaurant and winery, that opened earlier this month. Plus, they’ve got outdoor seating, which means you can catch great views of the city. We had a look at their menu and boy, are they serving up all our favourite Asian food – from sushi, dim sum and baos to Wasabi Prawn and Pad Krapow. If you thought the indulgence ends with meal offerings, we’ve got news for you. With a full-fledged wine and bar menu, pair your meals with boozy sangrias or a glass of rosé, or opt for a quirky mocktail like a Colada or a fruity punch. What’s more, they often host live music gigs, so you’re serenaded throughout your meal. Asian food, fine wine and live music sounds like a great time to us. So we’ll be popping in soon. You?